The event was regular Golden Age Constructed. Once I get her out, my opponent can no longer use any globals on their character cards. That potentially includes either version of PXG, Clayface, Kree Captain, Atlas, Supreme Intelligence, Thor and Heimdall. Using this card makes including any character cards with globals on my own team a foolhardy idea, but that’s something that can be worked around. 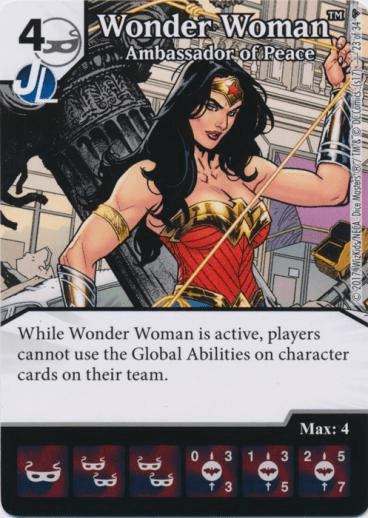 For my next step, I figured if I was going to bring Wonder Woman to restrict my opponents’ global usage I might as well pair her with common Scarlet Witch to hamper my opponents’ action dice usage. After that I added uncommon Madame Masque, to make it difficult to shut down either Wonder Woman or Scarlet Witch with Shriek or Blob. Speaking of Shriek, I decided to include one on my own team. But, to shake things up I decided to run a Shriek other that Sonic Beam (the first time I’d ever done that) so I went with Dark Empathy. My next addition was the Villainous Pact BAC, for several reasons. First was that between Scarlet Witch’s effect and having three Villains on the team, I was protected against the action being used against me in a decisive fashion. Next, the fact it’s a more limited Prep global than Resurrection (VP can’t be used unless the Prep Area is empty) fit better with my idea of limiting my opponents’ usage of globals. Having a Prep global of some kind would allow me to trigger a bag refill on Turn 2, increasing the chance I’d be able to field WW on Turn 3 (if I went second). Finally, against opponents who weren’t running Villian teams, buying the action became a potential win condition. Noticing the first four characters I’d put on the team were female, I decided to stick with that for the rest of the build. Needing some offensive capability I decided my next adds would be Common Yuan-Ti, Common Boom Boom and Thrown Brick. All 2-costs, one of them a BAC, so my early rolls would have to be truly dreadful if I couldn’t afford at least one Thrown Brick. And throwing a brick at something to deal damage from Boom Boom’s ability and/or make Yuan-Ti unblockable should allow me to get some damage in. because I figured if you’re going to go the Oppression route, you might as well go whole hog. Given the cost, and that it only allows you to take control of characters with an A of 2 or less it’s of limited utility. This was against our group’s resident youngster. Mostly Justice League characters from the new campaign box rounded out with Clayface and the purchase cost surtax Scarecrow. The big problem was she didn’t have anything I would describe as a win condition. Well, maybe Clayface, but while she bought his dice, she didn’t try to make use of his ability. I got WW out to monopolize the Clayface global, used Nocturne to take control of Scarecrow to nullify the surtax and started to grind away with Thrown Bricks and Boom Boom. She built up her field, and when she judged it to be sufficiently large, attacked with everyone. I’d been building up my own field and was able to block such that her entire field was KO’d while mine stayed intact but for a couple of Sidekicks. I was able to walk through her empty field on my turn, with a total A somewhere in the high 20s. Rare Human Outlanders, who deal 2 damage to target character die or player when KO’d. Paired with Uncommon Absorbing Man, who duplicates ‘when KO’d’ effects. And Golems, so he could use Fabricate to KO his Outlander dice. He also was running The Soulmonger SR action die which would have allowed him to bring back Evil characters that had been KO’d on his turn back to the field at Level 3 at the end of his turn – and, when the Soulmonger die is on double burst, deal 2 damage for each die so returned. He didn’t bother buying it against me, but I thought it was an interesting little addition to his team that was worth mentioning. I didn’t go for Black Widow first thing, which is what I probably should have done, and the first time I did draw her, I rolled energy both times. I did get a Black Widow die out on my next turn, and I did manage to keep rerolling character faces when he KO’d them after that. My Widows slowed down his damage output, and Scarlet Witch slowed down his intended ramp. I got some damage in with some unblockable Yuan-Tis, but I drew the Villainous Pact die I’d bought a little too soon – I hadn’t been able to build up my field enough for using it to be decisive. The colorful Ws (Black Widow and Scarlet Witch) bought me enough time to get to the time call, but that was all – he brought me down to 0 on his turn. I’m not sure this wasn’t closer than it should have been. I don’t think I was going to win without a lucky draw or a lucky roll – or more likely, a lucky draw combined with a lucky roll. But I think I came closer to getting such a lucky combination than I probably deserved. Slightly tweaked version of the Foetid Bloat Drone with Deadly combined with Hypervelocity team I’d played the week before. I made another mistake – I missed that one of the tweaks this opponent had made to the team was adding uncommon Blackbird and its global. I’d been a little too aggressive about using PXG last week, so I thought I’d delay my last use of it to my opponents’ turn this week. He then used the Blackbird global to shut down PXG, and I ended up putting 7 dice in my bag on my first refill instead of just 5. One of those 7 was Wonder Woman, but she was one of the last dice out of the bag, and I couldn’t land her the first time when I did draw her. So the part about restricting his global usage didn’t go according to plan. Now the Bloat-Drone he was running not only has Deadly, it requires all opposing characters to block when it attacks, so when it attacked alone it wiped out my entire field. Between that and the presence of a Hypervelocity which essentially required me to attack with at least one character each turn, he was able to grow his wall faster than I could grow mine, and he eventually overwhelmed me. Conclusions on the team. What worked and what didn’t. What would you do differently if you did it again. Basically a summary of the team. I matched up against one PXG user on the night, and between a misplay on my part and a little bit of bad luck I wasn’t able to get Wonder Woman out in time to do much good, so that part was disappointing. As for the team, well, my first conclusion is this was the wrong team to start running a Shriek who wasn’t Sonic Beam. 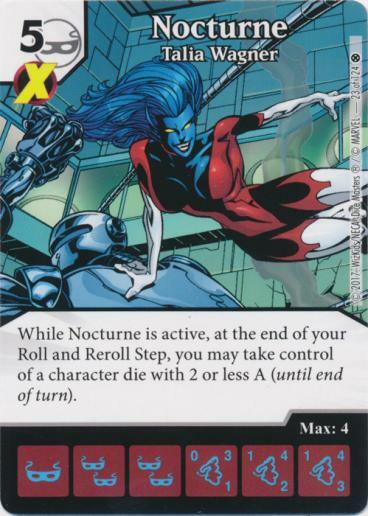 It’s a control heavy team, but without Sonic Beam or Blob, the only thing I have that affects my opponents on their turns is Scarlet Witch – and she only affects action dice. Other than that, I think this is a decent but not spectacular team that got matched up against a couple of opposing teams it didn’t match up with particularly well.